This is the Dover Bay area of North Nanaimo, where several trails lead down (often down 100-200 stairs) to a very long stretch of beach. 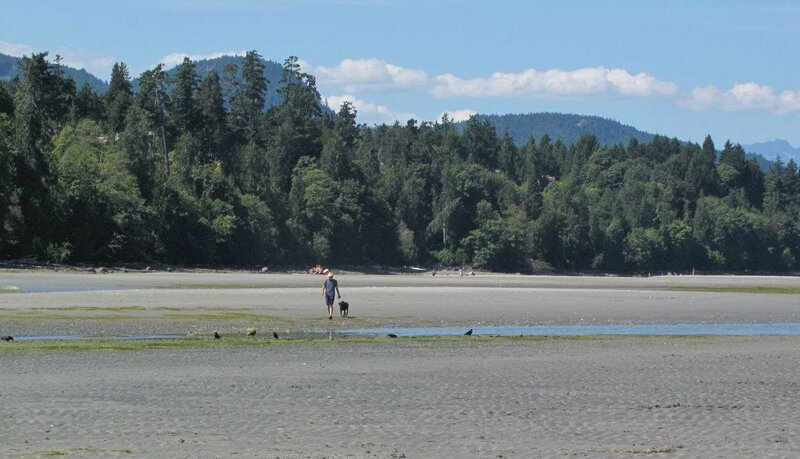 These are some of Nanaimo's best beaches, looking north across the widest part of the gulf. The problem is, these beaches are nothing but rocky shores during higher tides. So you have to check the tide tables (available online) to plan when you're going down there. One of my favourite things to do, is to go down there on a summer day (not too windy) at the lowest tide, and really enjoy the wide, flat sand/mud beach with its many creatures, enjoying the warm shallow waters and the waves that come in. How many people do you think would be on this beach, if this was somewhere more populous?! Down on the beach, it's easy to forget about the streets and developments above, as there is a thick belt of forest clinging to the steep terrain above the beach. There are some huge trees here, with eagles' nests up top.